Another reason why we came here is because I heard the InterContinental just welcomed a new pastry chef with a pretty impressive CV (I've forgotten exactly but it was probably Hermé, Ducasse and friends). I can't say my socks were fully knocked off - but they may have slipped down a little. I don't know the names of all the cakes I had, in fact, I don't know a single name. So I'll just try my best to describe what I had. The above was the absolute best of the lot. Essentially a chocolate cake, with mousse, a little sponge and a ganache/glaze over the top, but the highlight was the little sliver of tart, fragrant marmalade. Wowza. I kept thinking this was a mini Banoffi pie, but was told by HK Epicurus that it was in fact a vanilla tart. Perfect pastry, nice marshmallowy interior. To be quite honest I can't remember what flavour the cream and glaze were supposed to be. One thing about eclairs in Hong Kong, or perhaps Asia in general, is that the pastry goes soft quite easily. No one's fault, just an observation. Even Sadahru Aoki's eclairs, which are some of the best I've ever had, suffer a little from this. Fluffy, creamy, not too heavy - yep, ticks all the boxes. I would have liked a slightly tarter coulis/glaze, and it also looks like some of it's slipping off the side (see left side of the cake in the picture)... whoops. I guess by this stage I was just liking everything that had a slightly fruity or acidic element to it as I'd had too many egg salad sandwiches and was in no mood for anything remotely creamy, because I quite enjoyed this, and like the vanilla tart, the pastry fell apart with a little push of the fork - neither too crumbly nor too hard - spot on. Rose panna cotta? Lots of something that was like rosewater syrup , overall a bit too much of the same texture, but I usually like this sort of pudding-like consistency. Again I attribute my lack of interest to just being way too full from the sandwiches! I found these a bit dense, and it also made me wonder about how dry raisins used for baking are supposed to be, because these were pretty dry. Overall a decent tea, I would have loved to try more savouries, but then again, it's probably a bit crazy to complain about having too much truffle. The patisserie was promising, and while traditionally pastries tend to have lots of cream, it would have been nice to see a bit of fruit. Ha, what a Chinese remark! The rose pudding was really the only thing that made me go "huh? ", overall I think it's on par with Hong Kong's top hotel teas (which by the way, does not include the Peninsula - Tom sums it up in his post). With a view like theirs, they could have easily given up on the food and started serving crap, but they didn't, so thank you InterCon for serving good food with what I think is one of the world's most spectacular views*. *I'm biased, of course, but look at it and tell me you wouldn't be proud to call this home, or at least cross the bloody harbour to look at it**. 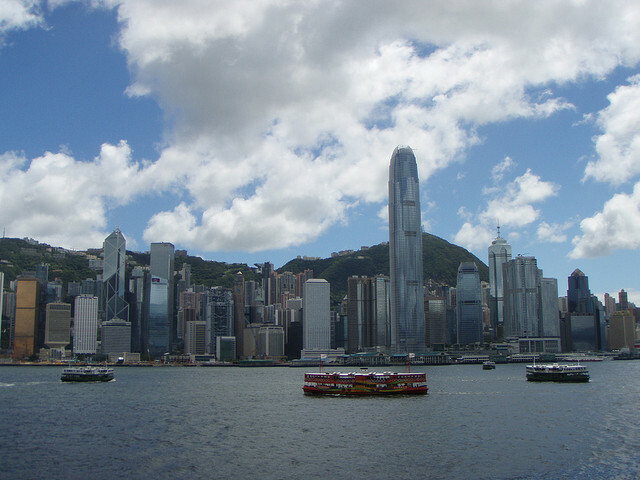 ** In HK, there's a running joke - or maybe not so much of a joke - that people who live on Hong Kong Island refuse to cross the harbour to the "dark side". Ironically, the best view of Hong Kong Island can only be seen from the dark side. The truffle egg sandwiches look delicious. And that is my favorite view of hong kong was well. Very very nice pix! And the view! Wow!